drop in to Downtown Comics for the pop culture collector you love! DTC has a huge array of stuff, from comic books to Game of Thrones mugs, superhero collectibles to board games, t-shirts and way more. if you don’t see it you may want to ask. owner Jason Conway is usually behind the counter – he knows what’s there and if he doesn’t have it, he’ll see if he can get it. 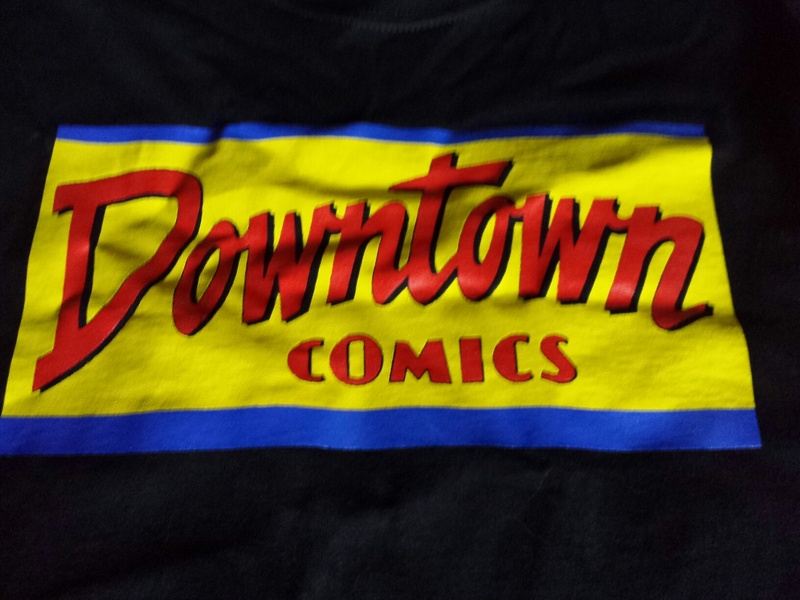 Downtown Comics has been on the go for 15 years. it is local, and it supports local. the pic is of a DTC t-shirt, which is made not far away by Living Planet. the store is also an entry point for the world of comic book art. local artist Wallace Ryan offers a course in Cartoons and Comic Books through the Anna Templeton Centre, and he is often found in the shop. They don’t mean minecraft! Join NLEE and other local people who want the kids to get outdoors at Cowan Heights Elementary on Wednesday for the Play Again film screening. 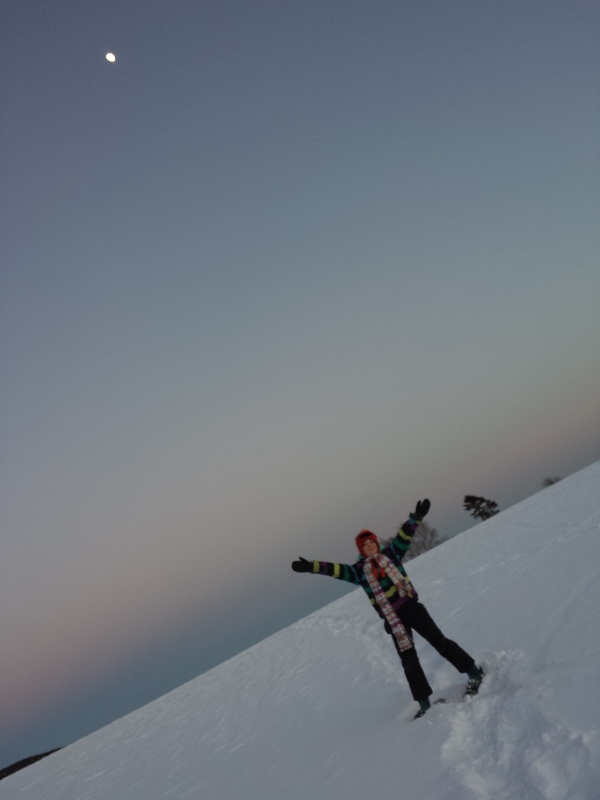 lucy and the sky. one diamond. ‘Needs must’ is an old phrase is not heard so often any more, but it fits perfectly with the #NLDark situation, and sustainability. On those days early in 2014 there was not enough electricity being generated in Newfoundland to meet the demand. Everyone was affected. The house was heated by the fireplace and my family was entertained by a Yellow Submarine puzzle, completed by snowglow. The environmentalists, the green people, the Al Gores and David Suzukis and so many more have been talking about conservation for decades. #NLDark proved that we can conserve when ‘needs must’. I know where I was when the rotating power outages started – heading up Torbay Road to pick up a pizza for a Christmas holidays sleepover party. No power on one side of Torbay Road, full blast on the other. Eerie. I didn’t know what was going on. Then Good Thing #1: People co-operated. At the Torbay Road Newfoundland Drive intersection (six lanes heading toward Torbay), the collective ‘we’ figured out the 24-lane-stop-intersection fast, and got it going with grace. If someone went astray (not waiting for their right turn), the collective we picked it up and resumed the accepted pattern. Nice eye contacts between drivers in parallel lanes. Ten points for us! Then Good Thing #2: People supported. Just a little further up the road Peter’s Pizza pick-up was like a kitchen party. The guy behind the counter seemed new, but was very friendly and upfront: there is a backlog. When he came out with a pizza he’d kind of announce it. One man was reading out the twitter feed to the rest. Another came in to pick-up a pizza ordered pre-outage. We welcomed him. He went to pay and was walking away from the counter when the Peter’s Pizza guy called him back and asked quietly (but we could all hear)…. “Did you mean to leave a $20 tip?”. “Yes.” said the late-comer. We all looked up! “It’s going to be awhile.” said Peter’s Pizza guy. “Maybe I’ll get mine first,” said the new-comer. All laughed (and he did not get his pizza first.). Gold stars! Then Good Thing #3: People conserved. 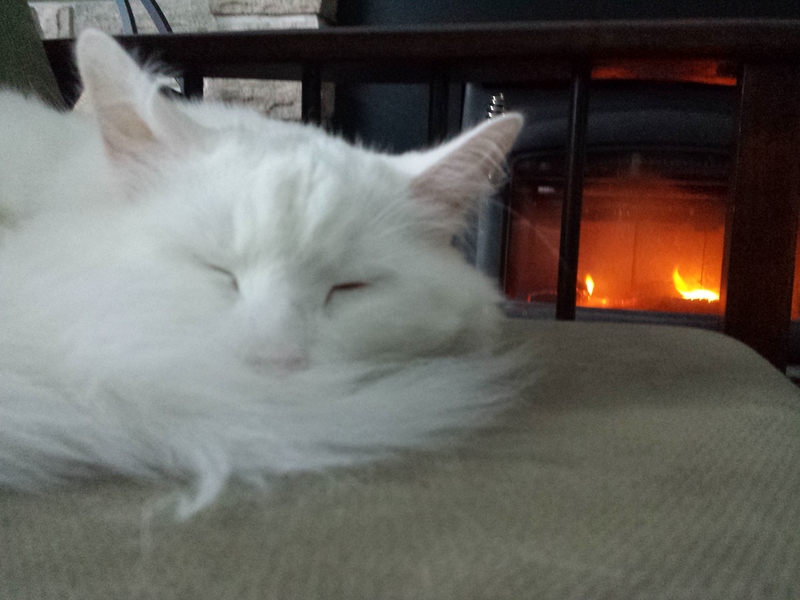 Arrived home to a powered-house, but little was on in the way of electricity. Our kids – the same kids who are unable to turn off a screen or a light – were on it. Turn off the Christmas Lights, don’t run the dishwasher, conserve conserve conserve was all over facebook. And it went on from there. People conserved. Hallelujah! What we waste is the difference between what we need and what we use. #NLDark showed that we have what it takes to do better when needs must. And that can be cozy. 30 Days – Day 28. Peace. the studio was closed on november 11 for remembrance day. so for me, so i took a non-asana practice off the mat. 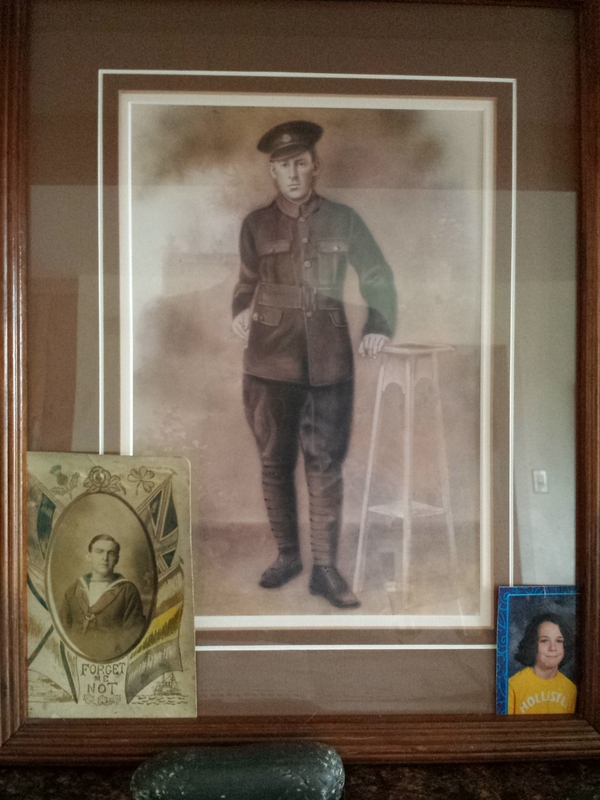 my grandfather, art smith was in the royal newfoundland regiment. his brother jack was in the navy. i am not sure that my grandfather would have thought of yoga. he was gentle and kind, but i was nine when he died and had not started my yoga journey. i think he would like how yoga helps cultivate peace. i know he would like how being mindful, seeing yourself as part of something larger that is compassionate, kind, respectful of self and others is good. as a boy he, and countless others, saw joining the war effort as a means to achieving that. many did not come back. both art and jack made it home to baine harbour, nl and life went on. 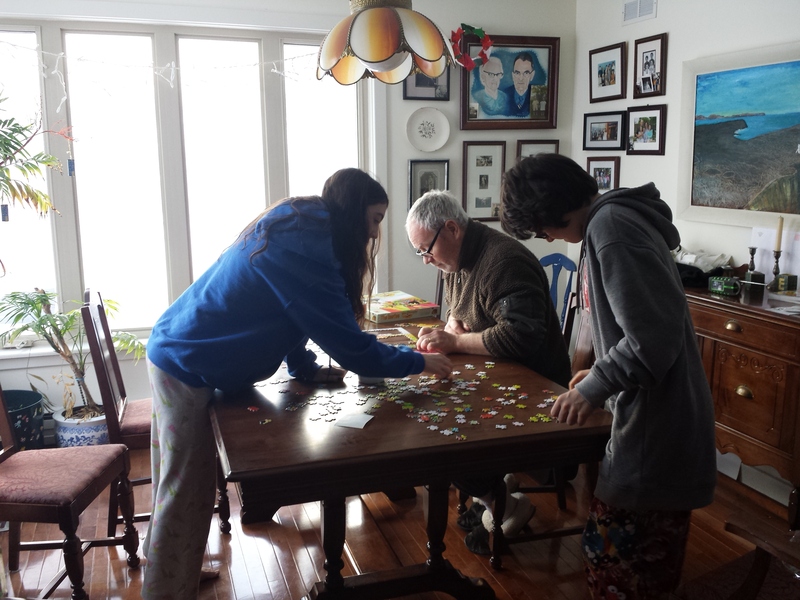 three of art’s grandchildren spent remembrance day afternoon totally screen-free in the kitchen. talking about the galaxy, baking and making – banana bread and pretzels, jam and candy – and saying ‘we should do this every week’. it was a good way to remember. and a good way to look ahead.